Registered Dexter cattle from the beautiful Willamette Valley in Northwest Oregon. 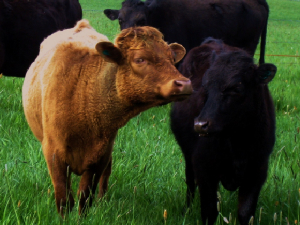 Our cows our fed naturally grown grass from our farm without antibiotics or growth hormones. Our Dexters are fed only home grown grass hay which results in healthier animals. Cows are happiest when they can graze on fresh grass and relax in the sun. Our Dexters are contented cows that produce tender, flavorful meat. The happier the cow, the better the meat! We believe in raising our cows the "ORGANIC" way. Our farm goal is to provide our customers with products that are safe for them and the environment. We take pride in raising healthy beef that you can feel safe in feeding to your family. Visit these links for more information on the advantages of grass fed beef. In the comment box tell us if you are interested in a whole or half beef. We will contact you with further details and make arrangements at that time. Let us know if you would like to be added to our beef waiting list. Please include a phone number if you would like a call back. For Cattle sales please tell us in the comment box what you are interested in. Include your phone number for a call back. We use Paypal for animal and meat purchases from our farm. Contact us for details.